We're delighted to have Stephanie Kate Strohm with us to chat about her latest novel, LOVE À LA MODE. Stephanie, what was your inspiration for writing LOVE À LA MODE? 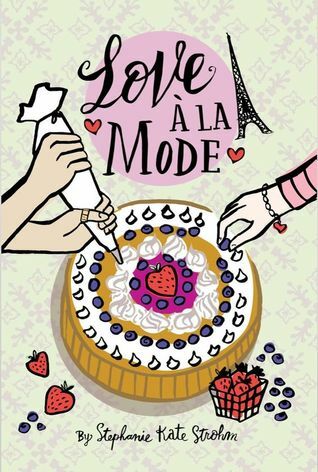 My inspiration for writing LOVE A LA MODE came out of two things - my love of cooking, and the semester I studied abroad in France while I was in college. I wasn't in Paris - I was in Poitiers, about an hour and half south of Paris - and during my time in France, I felt like I really learned a lot about myself. It was my first big adventure on my own, and I really wanted to capture that sense of falling in love with a place and how that changes who you are. And of course, I think France has the greatest baking culture in the world, and I wanted to share that! I had the hardest time writing the first two chapters - and then they ended up getting totally cut! What is the first chapter now was originally the third chapter. Turned out I didn't need all the background exposition that I thought I did! My favorite scene, however, is the very last one in the book. I'm so proud of it - I feel like it really captures exactly what I was going for with this book. Plus, it takes place on top of the Eiffel Tower! This book taught me how hard it is to step out of your writing comfort zone. Everything I've written previously was in first person - LOVE A LA MODE is in a close third person from dual perspectives. I think I grew a lot as a writer by pushing myself, but changing things up was harder than I expected it to be! What do you hope readers will take away from LOVE À LA MODE? I hope readers will think about the foods they love and why they love them. I hope readers will think about how food brings family together - either the family you're born with or the one your create. And most of all, I hope readers will want to explore, whether it's by traveling or trying something new! I mostly work at home while listening to music, but sometimes I like to mix it up and work at a coffee shop. The only thing I DON'T like to do is write in total silence - I need noise! Stephanie Kate Strohm is the author of It's Not Me, It's You; The Taming of the Drew; Pilgrims Don't Wear Pink; Confederates Don't Wear Couture; The Date to Save; and Prince in Disguise. She grew up on the Connecticut coast, where a steady diet of Little House on the Prairie turned her into a history nerd at an early age. After graduating with a joint major in theater and history from Middlebury College, she acted her way around the country, performing in more than 25 states. Although she was born in New York, she currently lives in Chicago, and doesn't discriminate against any type of pizza. When she's not writing, she loves baking, walking her dog Lorelei, taking dance cardio classes too seriously, and playing board games with her husband. Have you had a chance to read LOVE À LA MODE yet? How do you go about stepping outside of your writing comfort zone? Do you prefer noise or silence when you write? Share your thoughts about the interview in the comments!